For working women, pregnancy can become a big hurdle. 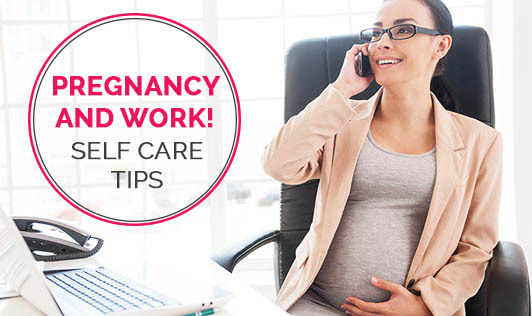 And if you are pregnant the first time, then you may have many questions in mind - as to whether it is safe to work during pregnancy, how long you should continue working, how will you cope up with fatigue, morning sickness, stress etc. The first thing you need to do is, check with your Gynecologist. If you are having a normal, low risk and healthy pregnancy, then you can definitely work until even few weeks before delivery. 1. Wear comfortable clothing and loose fitting shoes. 2. Seek the support of colleagues; do not make your pregnancy too personal. 3. Change your work positions often and take breaks frequently. This can help you relax. 4. Place a low level stool under your desk to keep your legs raised. This can help prevent varicose veins and swollen feet and ankles. 5. Accept help if offered by anyone anytime. Treat yourself as being lucky to be in a supportive environment. 6. Keep yourself well hydrated by drinking water, fresh juices, coconut water etc. This is also a chance to give a break for yourself. Keep a bottle of water always at your workstation. 7. Rest, if you can. Do not exert yourself at office and home. 8. Eat nutritious foods that are rich in complex carbohydrates and proteins. Carry fresh fruits and vegetables with you always. These can provide you anti oxidants, vitamins and minerals. Do not go for fizzy drinks and frequent instant beverages as they contain more caffeine. 9. Try to eliminate stress at your workplace by taking short walks, stretching, yoga, listening to music, interacting with colleagues, etc. 10. Don't feel embarrassed, if you have to make frequent bathroom trips. 11. Cut back on extra activities, if you have excessive working hours. 12. Avoid potential environmental hazards like noise pollution, chemicals, heavy vibrations and excess cold and hot environments as these can pose dangers to both you and the growing baby.